Fretted. Bluegrass and Play Along. Instructional book and 6 accompaniment CDs. With chord names, guitar tablature and guitar fingerings. 172 pages. Hal Leonard #CDKAUPL99. Published by Hal Leonard (HL.641411). 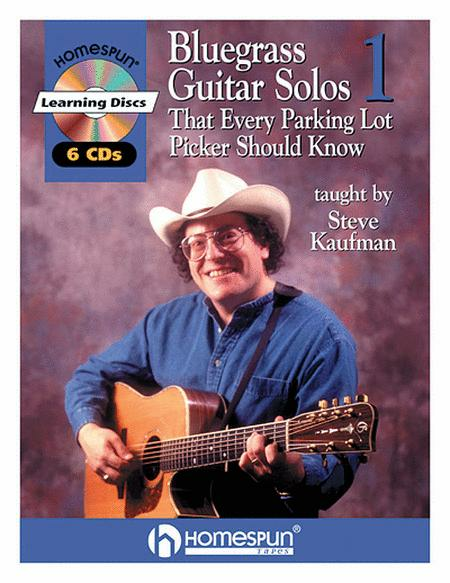 Bluegrass Guitar Solos (That Every Parking Lot Picker Should Know) features 20 great bluegrass tunes in standard notation and guitar tab and al so contains six 1 hour CD's for play-along with the rhythm track for a low price of $69.95.In response to numerous requests, Steve Kaufman's most popular audio lesson in bluegrass flatpicking is now available on CD! No more rewinding or searching for that elusive tune or lick. With the press of a button you can access just the piece or phrase you want to learn.Steve's unique formula works for players at all levels. 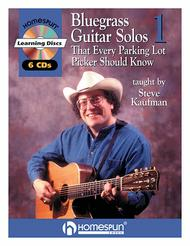 Beginners learn to pick the melody in its most basic form; intermediate pickers learn powerful licks and runs; and experienced players learn how to solo like a pro. Extra! The lead guitar on the right channel and the rhythm tracks (guitar, bass and mandolin) on the left provide a back-up band that allows for invaluable practice sessions. Great instructional material, Easy to read the tab. Steve does a great job of walking you the tough spots of s tune.